Author/adventurer Colonel Albert S. Evans wrote in 1872 that he observed Indians and Chinese working side-by-side in the fields, digging up potatoes, filling 100 to 125 bags per acre, each weighing more than 100 pounds. Barley, red oats, onions, early peas, lettuce, cauliflower, sweet corn, string beans, horse beans and Brussels sprouts were easily cultivated on the lowlands and sidehills; the sweetest strawberries thrived near the Pacific Ocean. The artichoke, “the dainty aristocrat among vegetables,” was a latecomer to South Coast agriculture but the choke developed a flavor in the Pescadero soil attained no where else. Irish oranges (potatoes) and alll the other vegetables were shipped from Pigeon Point to San Francisco. Dairies dotted the coastal slopes. Producers of cheese and butter, the Cloverdale Dairy was spread over 1700 acres. The Steele family numbered among the most successful dairymen. 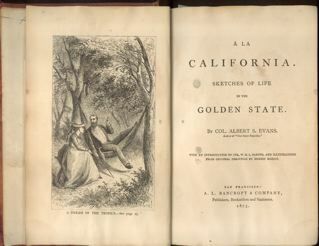 They were a large family, seven brothes and two sisters, who moved from Ohio to California about 1855. The Steeles projected the image of the sturdy American farmer. This entry was posted in Coburn Mystery. Bookmark the permalink.